The Rectangular Black Natural Marble Urn is an elegant urn made from natural black marble with white grain. The urn is simply adorned with grooved columns on each side. This urn can be personalized with an optional engraved Medallion Name Plate, as shown in the detailed image, or you can purchase a name plate from your local trophy shop. The name plate is black with a bright silver border. 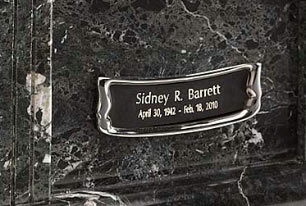 The Medallion name plate has a sticky back which will allow you to place the plate anywhere on the urn you wish. If ordering the Medallion Name Plate, please limit engraving to no more than 26 spaces for the name and no more than 33 spaces for the dates. A traditional vase-shaped keepsake urn in the black grain marble can be purchased separately. See our Keepsakes category. Approximate Dimensions: 7.25"(H) x 10.5"(L) x 8.5"(D) Dimensions can be off by 1/4 to 1/2 inch. Usually ships same business day if ordered by 1pm EST. Ships from the East Coast.